Moderate moisture. Woods, forests, thickets, bottomlands. Shade tolerant. 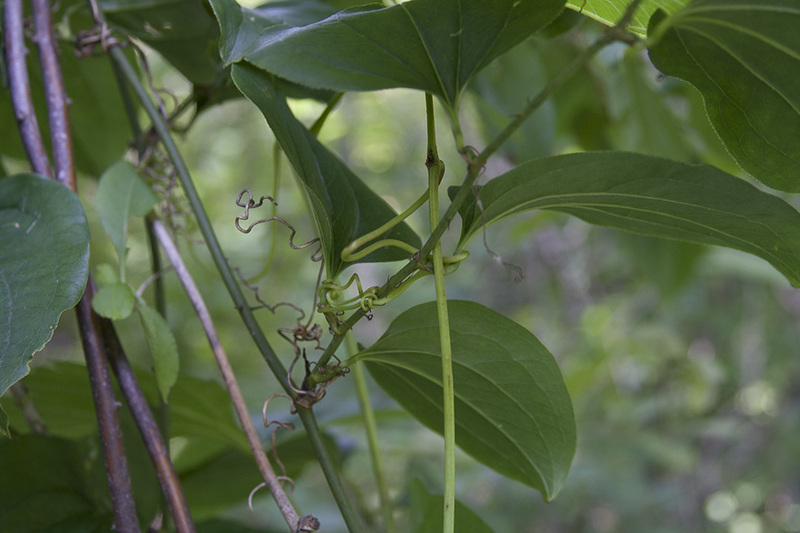 This is a climbing, perennial, woody vine that rises on a single or multiple stems from a knotty rhizome. The rhizome is short to moderately long and sends up stems at intervals of 4″ to 8″. It often forms dense colonies hanging from the lower branches of trees. 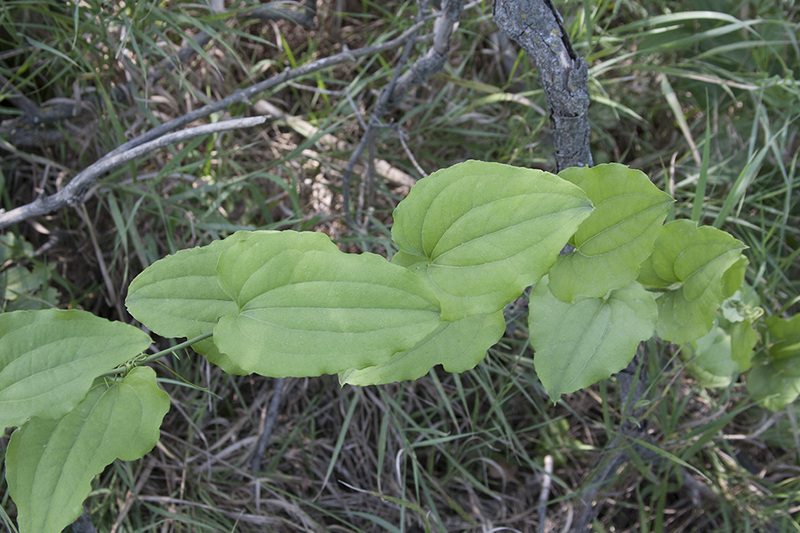 The stems are slender, woody, hairless, green, branching, and up to 30′ long. 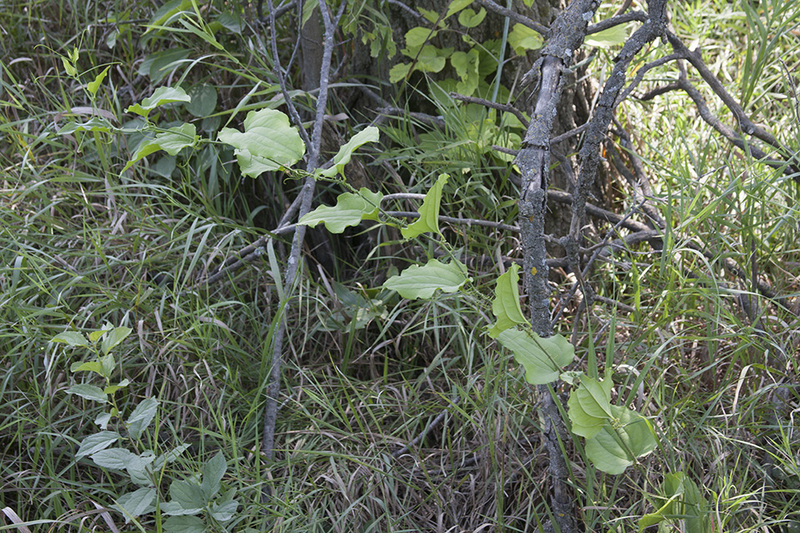 Older stems do not produce bark. 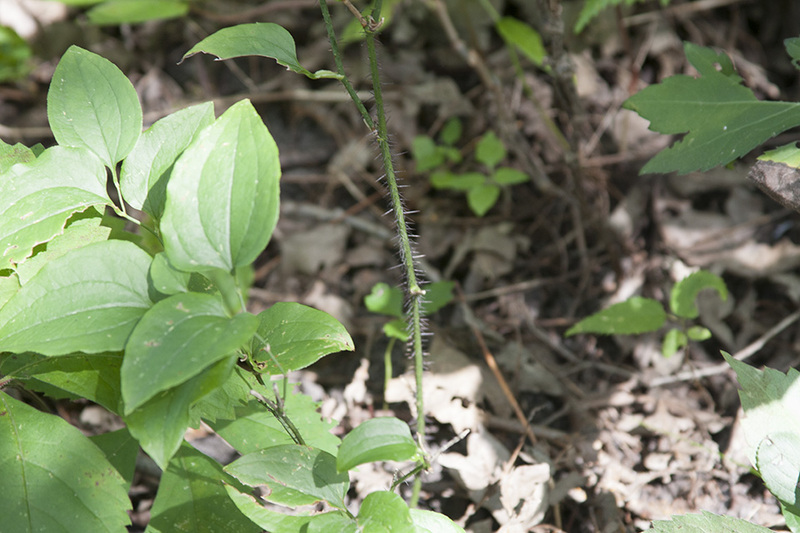 The lower part of the stem is densely covered with prickles, the upper part has widely scattered prickles. 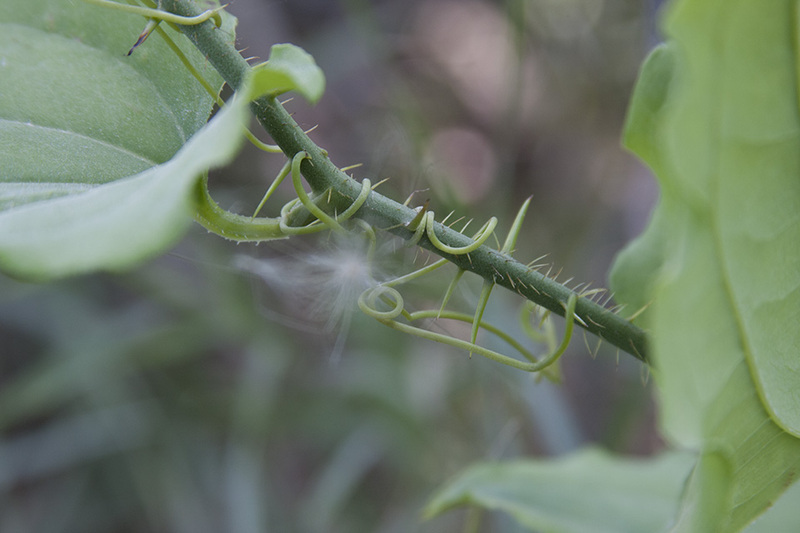 The prickles are needle-like, 1 ⁄32″ to 5 ⁄16″ long, and variable in size and form. Some are thin, flexible, and bristle-like, others are stout, firm, and spine-like. They are initially green, eventually black. 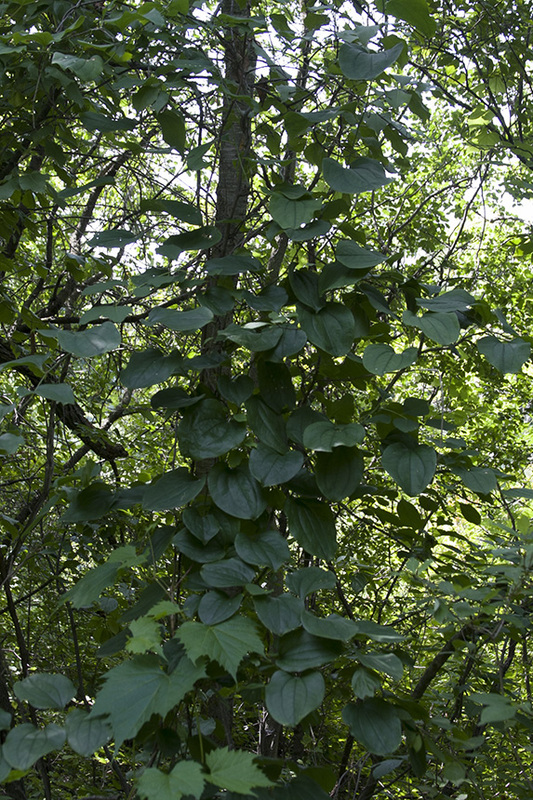 The leaves are alternate and deciduous. 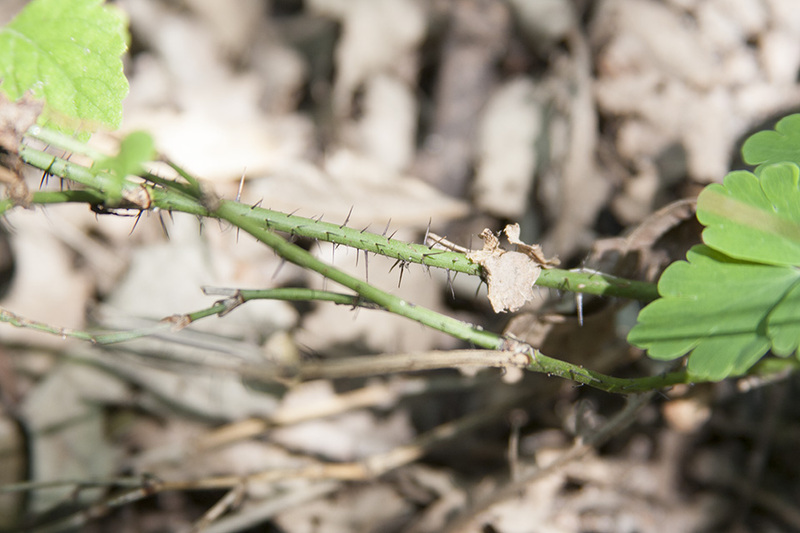 They are on hairless, ¼″ to ¾″ long leaf stalks that are shorter than the leaf blades and have a pair of up to 4″ long tendrils at the base. 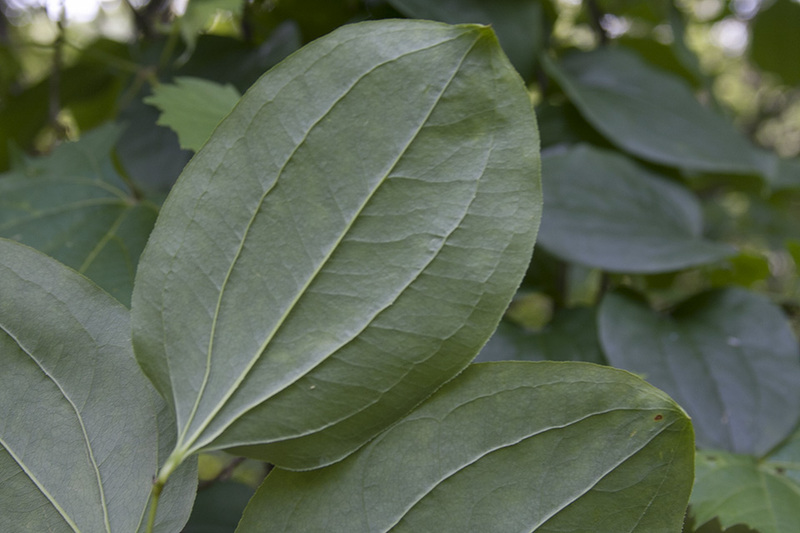 The leaf blades are thin, broadly egg-shaped, 2⅜″ to 6¼″ long, and 1½″ to 5″ wide. They are not glaucous. They are heart-shaped or wedge-shaped at the base. The tips are either rounded or taper to a point with concave sides along the tip. 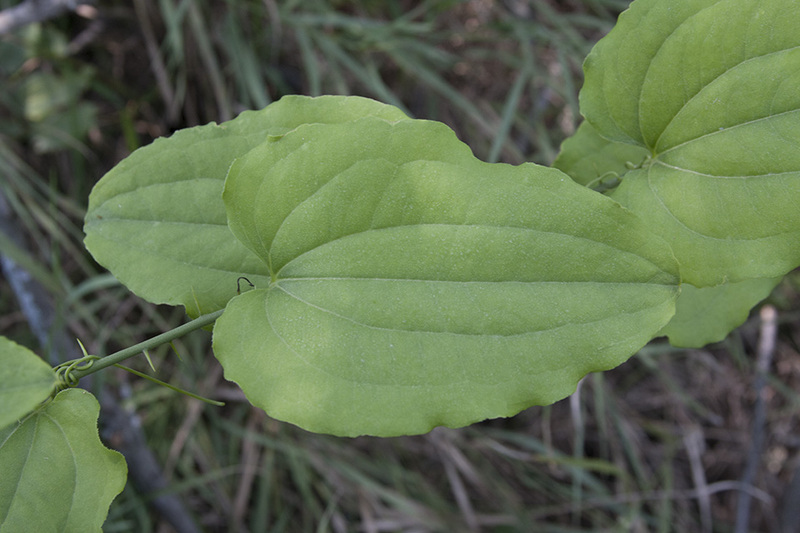 The upper surface is green and hairless with 5 or 7 conspicuous veins that arch from the base of the leaf blade and converge toward the tip. The lower surface is as dark as the upper and is also hairless. The margin is fringed with minute, sharp, forward-pointing teeth. The margin is not thickened or lobed. The inflorescence is an globe-shaped, 1½″ in diameter, umbrella-like cluster (umbel) of 10 to 25 flowers rising from the leaf axils of first-year branches. 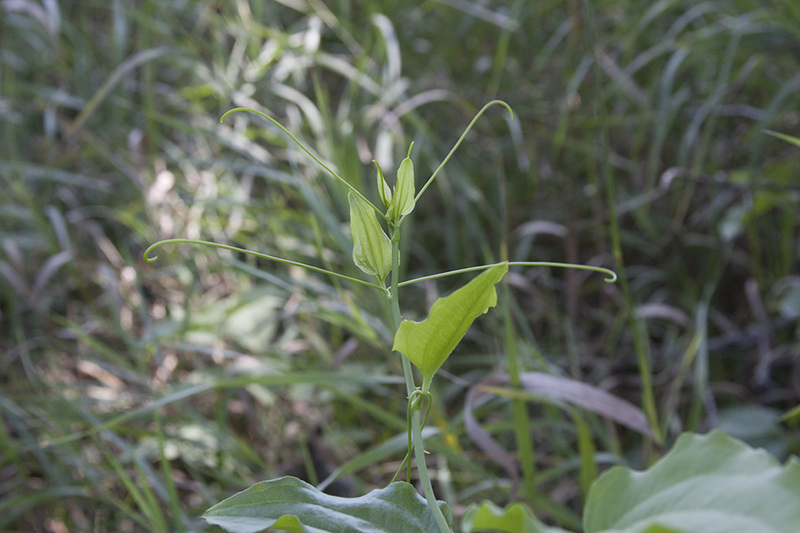 It is on a hairless stalk that is 2 to 4 times as long as the subtending leaf stalk. Male and female flowers are borne on separate plants. There are 3 greenish-yellow, strap-shaped petals and 3 similar sepals (6 tepals). The male flowers have 6 stamens with yellow anthers. They appear in late May to late June. 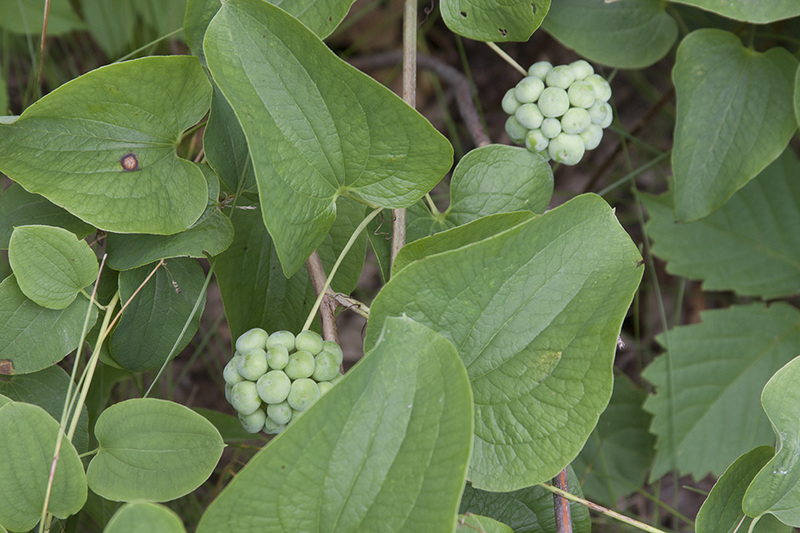 The fruit is a dark blue to nearly black, globular berry, ¼″ to ⅜″ in diameter. It is not glaucous. It matures in early August to early October. 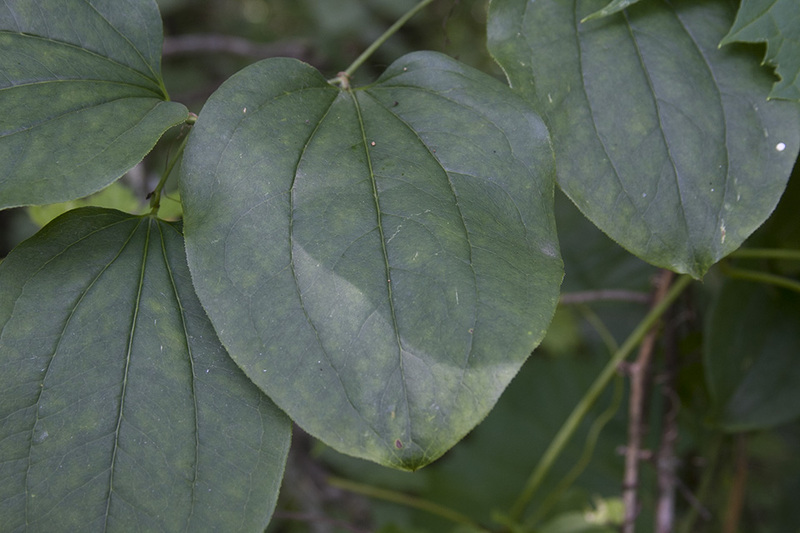 Roundleaf greenbrier (Smilax rotundifolia) has stout, inflexible prickles. The fruit is glaucous. 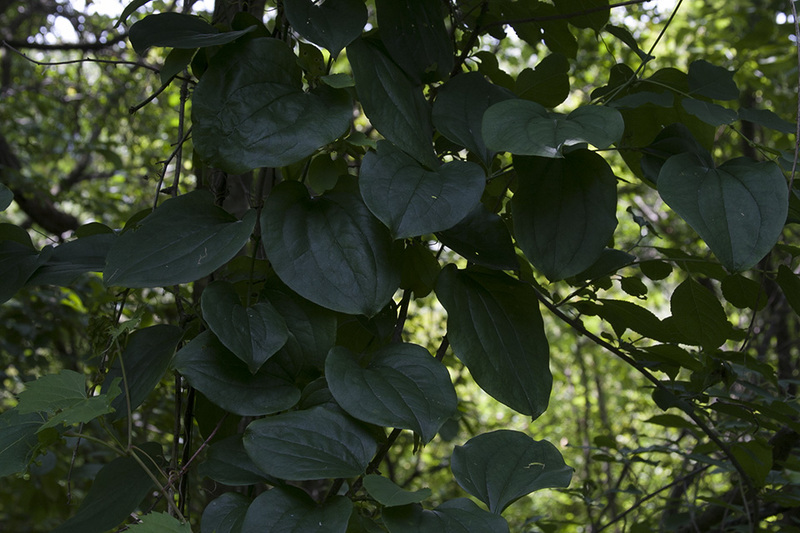 Other carionflower (Smilax) species found in Minnesota have no bristles or prickles. Pale green or bluish gray due to a whitish, powdery or waxy film, as on a plum or a grape. Refers to both the petals and the sepals of a flower when they are similar in appearance and difficult to tell apart. Tepals are common in lilies and tulips. A flat-topped or convex, umbrella-shaped cluster of flowers or buds arising from more or less a single point. Location: Oak Grove, MN, private residence, acreage, just outside of Cedar Creek Conservation Area. Noticed this vine growing last year. It can be seen easily from the road.